1-Channel 3G-SDI/LC Multi-Mode LC Fiber Transceiver - Requires 2 slots in frame. OG-FIBER-TR-MM offers unmatched flexibility and cost efficiency for 3G-SDI Fiber conversion, allowing for cable runs up to 700 m (2296 ft) for OM4 and 300 m (984 ft) for OM3 for Multi-Mode fiber optic cables - useful for eliminating ground loop problems. 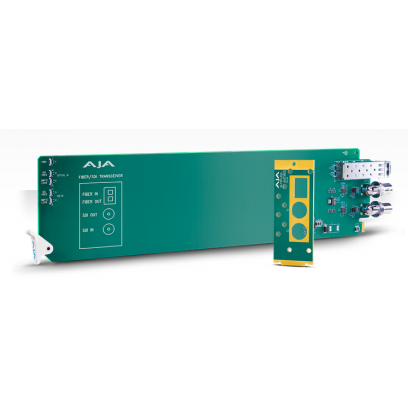 Both Fiber and 3G-SDI inputs are re-clocked with best in class input jitter tolerance. 3G-SDI rates of 270Mb, 1.5Gb, and 3Gb are supported. Both signal paths are independent and can be different rates. Supports Multi-Mode fiber cable.